6" and 8" available in packs of 1, 2, 3 and 4. Green Lamp are proud to present one of our latest additions, the 6" and 8" Cool Tube Reflectors. Additional external double wing reflector extension. Comes with 4m pre-wired IEC lead. Hammered, dimpled, anodised aluminium, highly polished reflective surface. 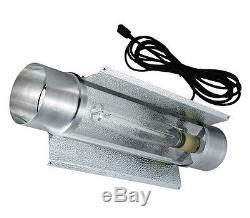 Suitable for E40 fitting Sodium, Metal Halide lamps: 250w, 400w & 600w. CE marked and RoHs approved. Standard 6" or 8" duct connects to either side (use clips and/or ali duct tape). 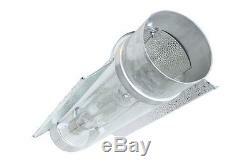 Cool Tube Reflector in size and quantity selected. UK Mainland - Parcelforce 24hr = FREE. All items bought before 2pm are sent out the same day. The item "Cool Tube Reflector HID MH Ventilation Grow Room Air Cooled 6 or 8 inch" is in sale since Friday, October 16, 2015. This item is in the category "Garden & Patio\Hydroponics & Seed Starting\Grow Light Kits". The seller is "green-lamp-ltd" and is located in Cheltenham. This item can be shipped to United Kingdom.